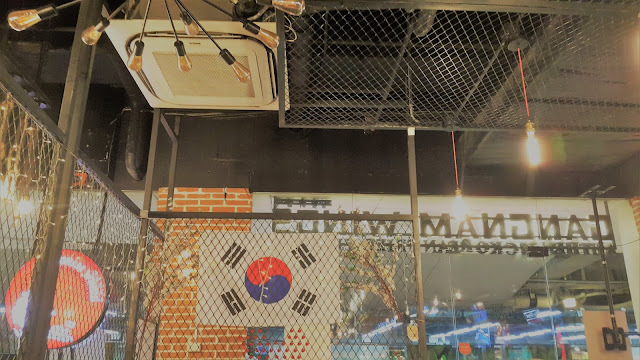 Situated right in the heart of SM Megamall, Gangnam Wings can be easily spotted and a must try in Ortigas. 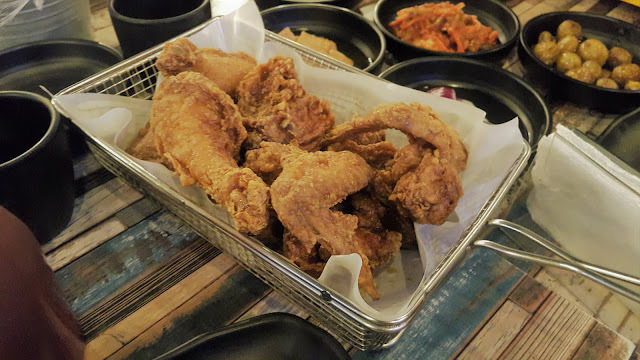 Stating the obvious, on top of their best-seller is the chicken wings that I instantly fell in love with and since then, I enjoyed more items on their menu. Here's the overall experience that my newest team had. If you happen to see YG Republique before, then it would give you that feel but a little bit on the smaller scale. 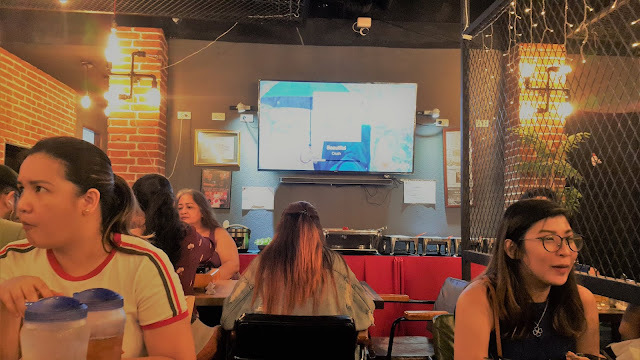 Initially, the first thing that would pop up in your mind is that the place is a sports bar as it looks like one. 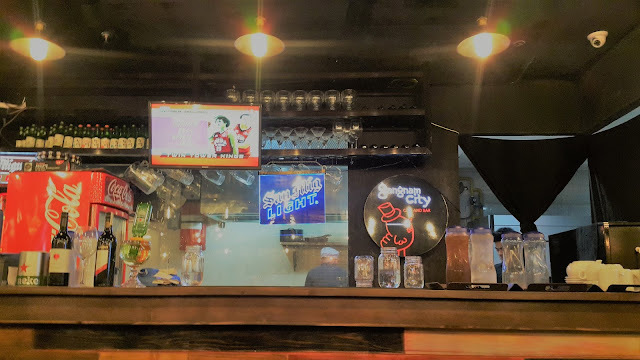 Giving that open space yet enough division, I have to agree that Gangnam Wings modified the space yet kept the privacy of groups when they dine in. It has great interiors and just enough lights to give a chill vibe. 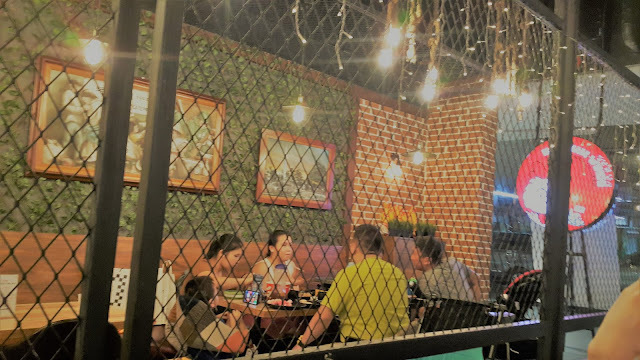 When I contributed for a write up before about a certain restaurant in Korea, I was sent a photo that has the same design as this place so I am very amazed that it does exist here in the Philippines. 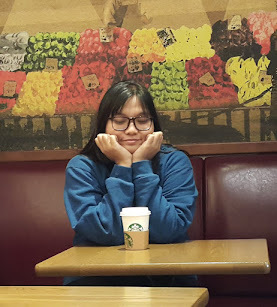 It's just unfortunate that the first sit I chose seemed to have droplets of water coming from the aircon on top of me so I transferred to another seat. They also have buffet choices for other packages. I could eat this salad and fries alone without the chicken or meat. Yes, it's super good! 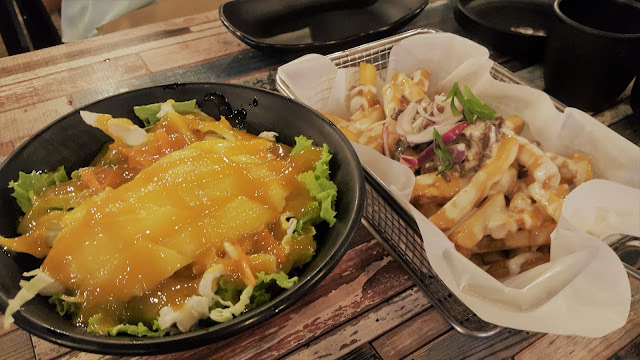 The fries is topped with bulgogi chops while the salad is mixed with mangoes. One of my favorites amongst the ones served is this buddae jjigae. Somehow, this reminds me of the first time I tried this dish. Yes, I suddenly missed those days. Additional to our order is this samgyupsal! 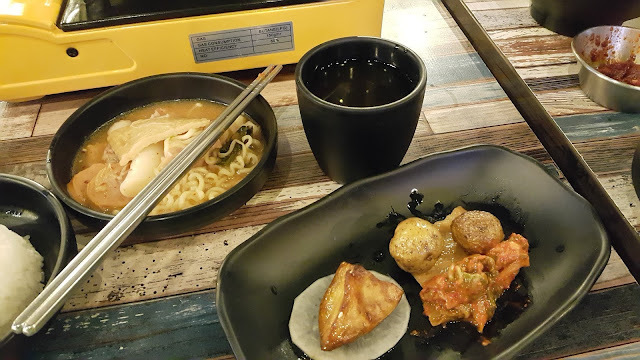 I tried a few but since I'm quite not a fan of Samgyupsal (or I just had some a few days ago), I didn't enjoy it that much. Nevertheless, it has the traditional sauce. Unfortunately, I am pretty sure that the baby potatoes they served me are somehow spoiled already. (Close to spoiling and I am very disappointed with that.) At first, I thought it was because I had it with Kimchi but I tried it again after drinking water and that confirms my thoughts. I also asked my friend to confirm with my suspicion and it's right! 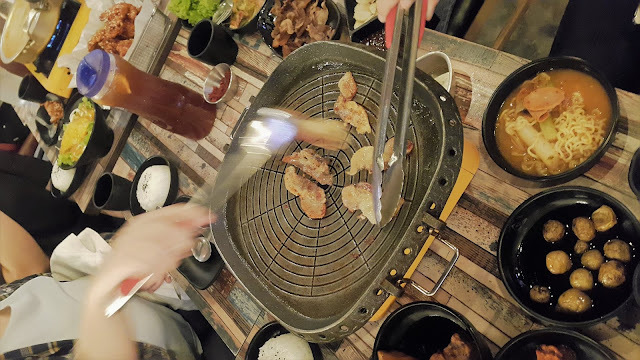 We opted not to call the attention of the staffs because we were all busy chatting and that there were plenty of choices on our table. 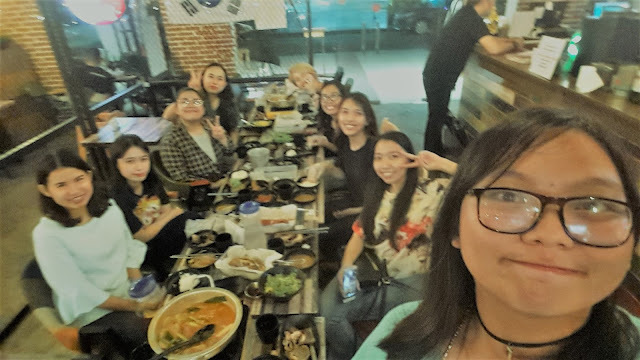 We ordered set meals as we were quite numerous in the Kpop channel team. It's actually my first time to meet them and I'm glad that it was over a meal! The set comes in different forms and we chose the group meal that's good for six people. 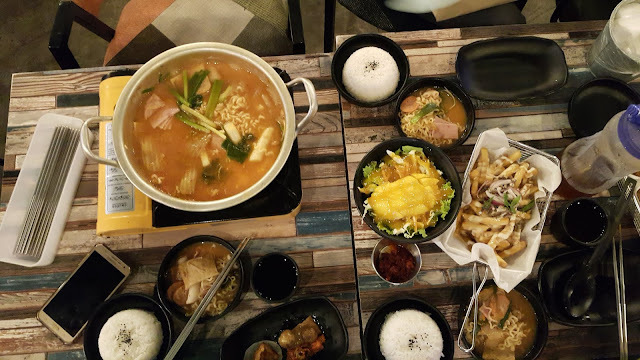 The set includes whole chicken, buddae jjigae, 6 cups of rice, 6 glasses of iced tea, french fries, mango salad and mango bingsu. Our team ordered two! Overall, the team had fun talking during the night out. It's nice to meet the team of Kpop Channel TV! 1. You may find it a little bit expensive but it's a good thing that the food selection is great. 2. One must not miss the fries! 3. 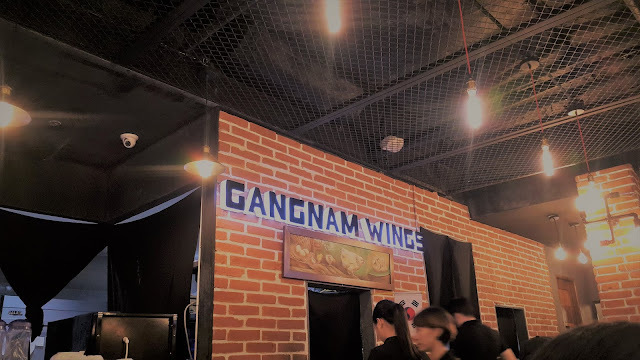 They deserve the name 'Gangnam wings,' to date -- they have the best chicken flavors among the Korean restos that I tried. My family and I are always on a lookout for other korean restos and food joints. Will try this one. 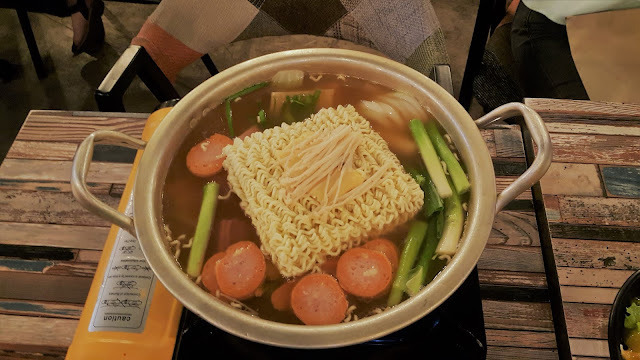 I would love to try that out on our next food trip with friends!